When we engage and talk with others, especially other artists and makers, what you can learn can be amazing. The conversation might take you to places you would never expect. When deciding what I wanted the “voice” of my blog to be I knew much of it would evolve around sharing great recipes however I wanted it to be more than just a food blog. I have grand ideas (you have to think BIG, right?!) and envisioned it becoming a creative space where other small business owners, or anyone really, could come to to find out about great food, business tips and resources as well as to learn about other artists and makers and how they “design their sweet life”. In my “A conversation with” series each month I will be sharing an interview (of sorts) with an artist or maker. I hope you enjoy today’s conversation with Carole Ferro, half of Frog Pond Farm Studio. A husband and wife artist team who embody and truly live their lives in “true artist” fashion. Enjoy part one and stay tuned for more in the next week or two. My parents have lived next door to Tino and Carole Ferro of Frog Pond Farm Studio on Little York Lake in Preble, NY for about 10 years. I had the pleasure of finally meeting them last fall during my 2 month stay in NY while my Dad was sick. Carole was sweet and checked in on me during the days I didn’t drive out to the hospital. One day while out walking my dog she spotted me and ran out of her house and invited me in for a tour of their home which is a work of art in itself. There is art, pieces from historic buildings, furniture from estate sales and sculptures everywhere, even on the many roofs and wall that surrounds their house right on the water. Tino has carvings in the woodwork throughout the home. While visiting this July I stopped down to their studio retail space which is in a massive old barn and got to reconnect with her and our conversation turned into quite the story and I learned more than I even imagined. I had learned a little bit about Carole and her Husband Tino and their family over the years from my parents. They were quite fond of them, their kindness and the art they created, owning a few pieces themselves including a walrus made out of an old propane tank, a beaver and a couple of pelicans. 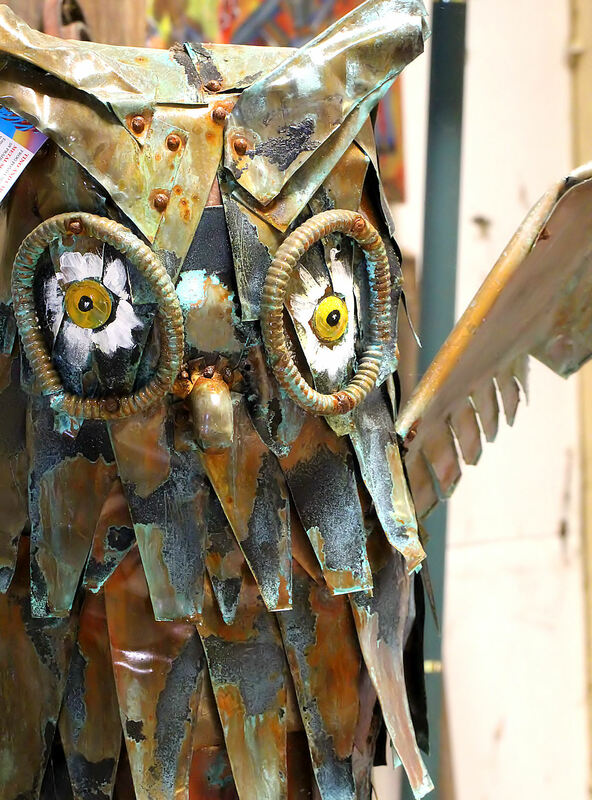 Tino specializes in creating metal sculptures made from reclaimed and often unwanted materials. Carole often helps with the finishing process and when I ran into her this hot July summer day she said “just look at my hands, I’ve been over at the shop painting”, her hands spotted with paint from one of the sculptures she was adding some finishing touches to. From small to extremely large the size of the sculptures Tino creates is just part of the “oh my” reaction many have when viewing his work. When you take a closer look, on some of the pieces, you can see some of what the materials where in their previous life and other parts just melt away and become something new. As we began our chat inside the barn a women who was jogging by stopped in looking for a gift for her parents. They had talked about their fondness for their sculptures and she wanted to get them something unique for their anniversary. 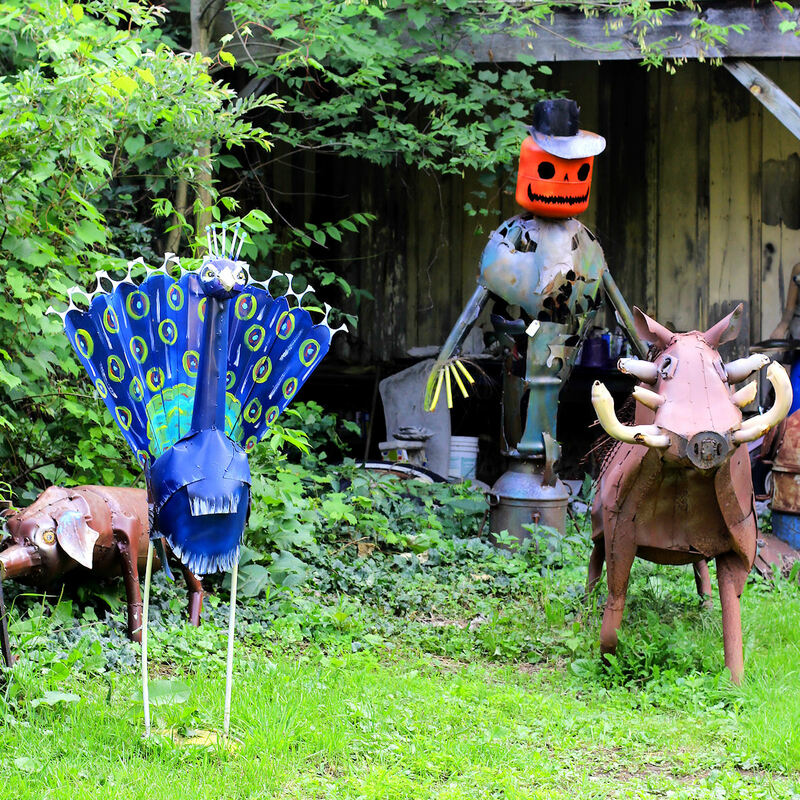 Many sculptures can be seen just by driving by the road leading up to the studio barn and locals in the area have them on display in their yards. 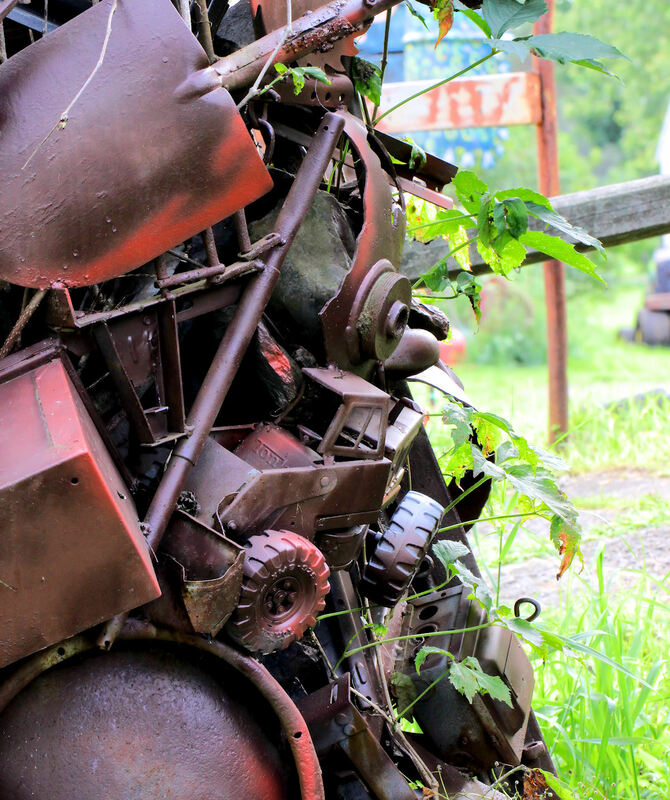 Her father had mentioned seeing 2 frogs on a motorcycle over the years and she wanted to get something similar…minus a bike. “They are at an age I do not want them to even think about getting a bike, can you do something similar but with a boat”, she said. Of course said Carole, adding that there might even be one out front. We walked out of the barn with her to show her the gondola with frogs that sat down by the road. Carole called them her Italian frogs. There were two frogs sitting together and another steering the back of the gondola. She liked it however it was an impressive sized piece and she asked about something similar but a little smaller with frogs in a canoe perhaps. Carole said “sure thing, we can do anything, just run back down the lake road and look for the big white barn with all the old junk around it, you can miss it. Tino is there working and tell him what you want and he’ll draw something up for you and give you a quote”. Off she ran, literally, to go talk to Tino about creating something for her parents special anniversary. No appointment needed, no today isn’t good come back when he is here, just the directions (of sorts) to go talk to the artist himself. I hate to admit we got so involved in our conversation that I missed taking a picture of their Italian frogs in the gondola! 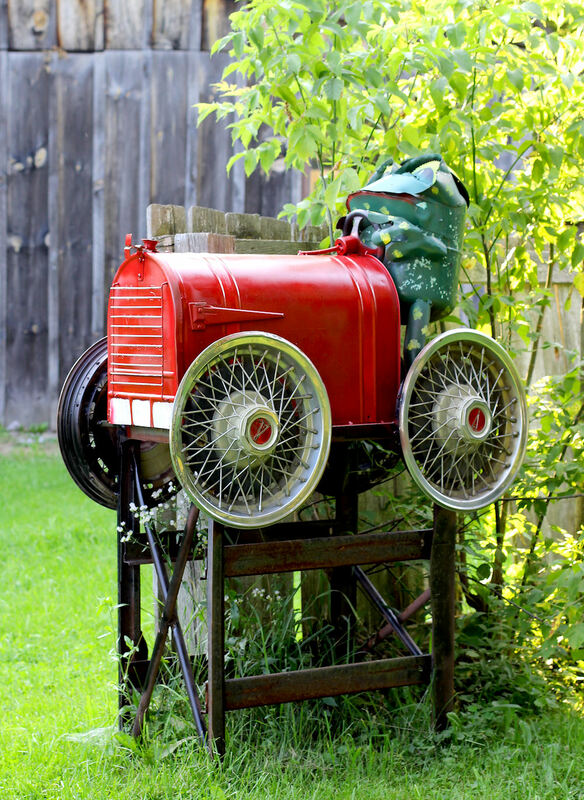 They were in the fun whimsical style like their frog mailbox sculpture. I will get a shot the next time….unless it has sold. To find out more about Tino and Carole Ferro and Frog Pond Farm Studio you can check out their website and if you are ever in Preble, NY near Little York Lake be sure to stop by. You can’t miss it. 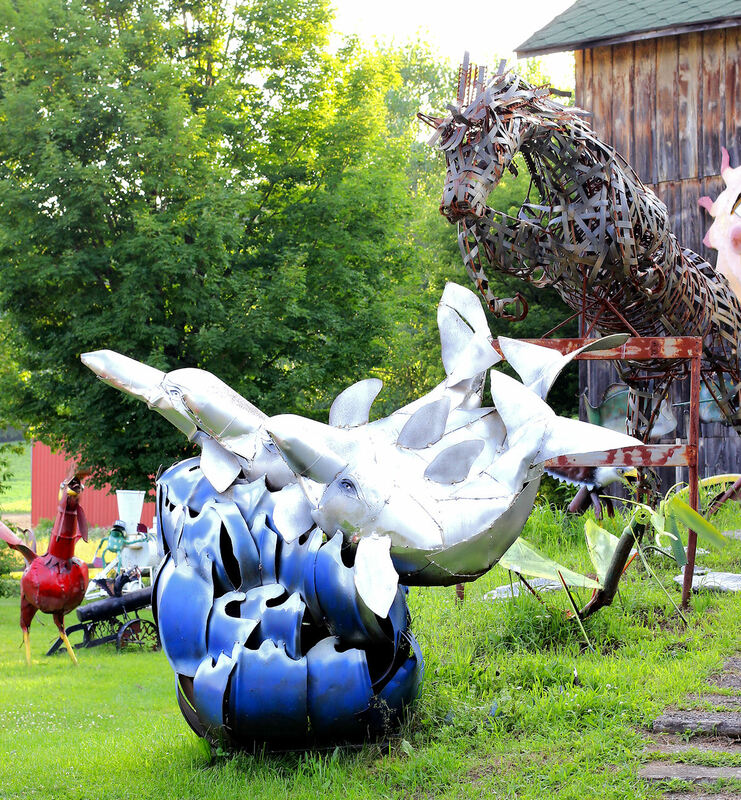 It’s the big barn with all of the metal sculptures in the yard and there are sculptures down the road leading up to it too, a moose, tall giraffe and more. You’ll be glad you stopped, it is quite the experience for your eyes and you might get to hear a story or adventure from Carole herself. You won’t want to miss the continuation of our conversation I am still in awe of what I learned. All photos shown in this post are by Esther Holden of A Sweet Life Designed, Copyright 2015, All rights reserved. Join our sweet newsletter so you can stay up to date on new recipes, creative happenings, tips and freebies!